Have you ever wanted to see what was happening at that one event you could not go to? Did the plain text-backchannels somehow left you feeling disappointed? Twitterfountain comes to your aid: we mash up tweets and Flickr-images that share the same tags into a spectacular visual. Here’s a sample — thanks to Socialfish Maddie Grant and Lindy Dreyer — a mashup of Twitter updates and Flickr photos, tagged #asae09, that gives us a taste of the buzz around the American Society of Association Executives (ASAE) annual meeting on now in Toronto. 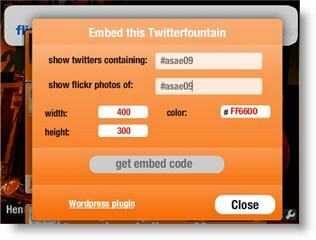 Login to your website, go into HTML edit mode, and paste the code where you want your Twitterfountain to show up. A new, cleaner, crisper version of the Twitterfountain application is on the way, with a less intrusive title bar and more customization options — you can preview it here — and all the “old” Twitterfountain widgets that are currently embedded on blogs and websites will be updated automatically with the new version when it’s ready to go live. Interesting idea. This could be very effective, I look forward to trying it out. Thanks for sharing this! This is new to me, I just tried it. Are the messages are clickable? "Entertainment Blog" - the tweets are intended to be clickable, but I understand from the developers feedback site that there have been a few issues with that feature, depending on what platform the twitterfountain is embedded on. Have you checked their website/blog for updates on your issue?